Since beginning the Washington Semester Program this fall, Lauren Hince has gotten valuable insight into her academic and professional career. 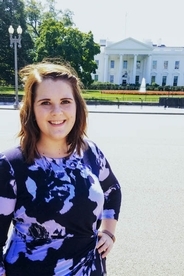 At her home institution she is a double major in Communication and Politics and Government, and here at AU she has a concentration in Journalism and New Media. She credits WSP for giving her clarity in combining the two courses of study. This semester she is also interning on the Hill with Senator Amy Klobuchar from Minnesota. While on the Hill, Hince has had the opportunity to speak with many communications professionals. Many of them have suggested that working right after college is the best choice for young professionals. Hince now believes she can wait a while before attending a graduate school program. Hince is happy she chose to attend this program, especially since she knows she wants to live in D.C. once she graduates. By attending WSP, she gets a head start on gaining professional connections in the city where she wants to start her career.